PHOENIX ─ Mayo Clinic Hospital, Phoenix, Arizona is again ranked No. 1 in Arizona and the Phoenix metro area, and No. 11 nationally by U.S. News & World Report. This marks the second time Mayo Clinic has been recognized with two hospitals on U.S. News & World Report's "Best Hospitals Honor Roll," which includes the top 20 hospitals in the nation. Mayo Clinic’s campus in Rochester, Minnesota, ranked No. 1 nationally. The results were announced today on the U.S. News & World Report web site. Watch: Dr. Wyatt Decker discusses the U.S. News & World Report rankings. Journalists: Broadcast-quality sound bites with Dr. Decker are in the downloads. Since opening its Scottsdale, Arizona, location more than 30 years ago and its hospital in Phoenix in 1998, Mayo Clinic has grown to become a vital part of Arizona and the Southwest. Mayo Clinic has brought many medical innovations to Arizona, including Mayo Clinic School of Medicine – Arizona Campus, the development of the first proton beam therapy program in the Southwest, and pioneering work in regenerative medicine and individualized medicine. Also, within the past year, Mayo Clinic's Arizona campus has grown to become the largest organ transplant program in the U.S., and the hospital's nursing program has received Magnet quality status from the American Nurses Association. In addition to the Arizona ranking, Mayo Clinic’s campus in Rochester, Minnesota earned the No. 1 overall spot nationally on U.S. News & World Report's "Best Hospitals Honor Roll." Mayo Clinic also took the No. 1 spots in Florida and Minnesota. Mayo Clinic’s commitment to quality and collaboration dates back more than 150 years when the Mayo brothers invented the team-based approach to medicine – an approach that is continuously refined over time. Then and now, Mayo Clinic’s experts work closely across specialties to provide comprehensive and coordinated care for patients with the most serious and complex conditions. 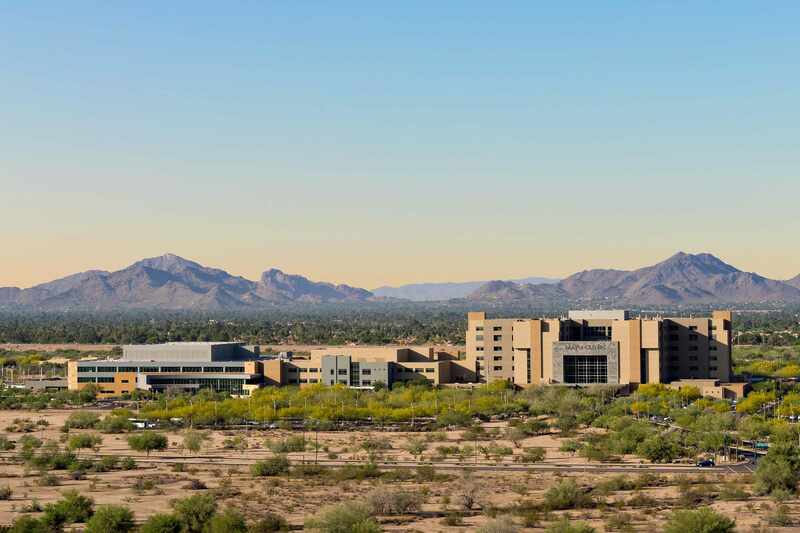 Mayo Clinic’s Arizona campus provides more than 65 medical and surgical specialties, including programs in cancer treatment, organ transplantation, neurology and cardiology. In Arizona, more than 7,100 Mayo Clinic staff members serve nearly 105,000 patients per year from all 50 states and many countries. Mayo Clinic Hospital in Arizona is a 268-bed, seven-story facility with more than 12,000 admissions per year and nearly 26,000 Emergency Department visits. Mayo Clinic has an annual impact on the Arizona economy of more than $2 billion. This is the 29th year that U.S. News & World Report conducted its rankings, which encompasses 16 medical specialties. U.S. News & World Report analyzes data for 5,000 medical centers to determine the rankings.